Can't get enough of This Is Us and its amazing cast? Neither can star Milo Ventimiglia, it turns out. 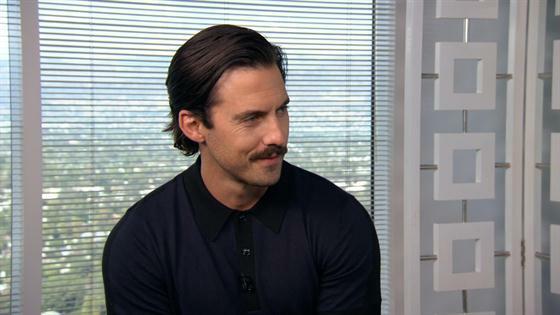 The actor, who stars as dad Jack on the twisty and heartfelt family drama, sat down with E! News' Sibley Scoles to talk about everyone's favorite new series—and he had only great things to say about his co-stars. Take this gushing comment about his on-screen wife Mandy Moore , for instance. When asked if the pair had ever met before, he admitted they hadn't and that their incredible chemistry was practically instantaneous. "But she's so giving and so lovely and has such a kind heart that it's not difficult—and she's beautiful, so it's not difficult for me," he said. "It just works." And when Scoles broke the news to him that, during a recent appearance on Watch What Happens Live, Moore admitted that Ventimiglia was the best on-screen kiss she'd ever had, while he was a bit skeptical at first ("But is that kind of like, 'My current boyfriend is the guy that I love the most? '"), he was quick to say the same about her. You know what, because it's more than just an act," he added. "You're with someone and it's deeper than just the physical, you know? There's a moment, you're looking into someone's soul, you're looking into their eyes, you're seeing them. And I think, not I think, I know—when the cameras are rolling, it's Jack and Rebecca, and they have a deep, deep connection." Now, if you think that's sweet, just wait until you hear what he had to say about Sterling K. Brown's recent Emmy win for his work as Christopher Darden in The People v. O.J. Simpson. "I was on a plane. I was flying to the east coast to go do press...and I signed up for the Wifi on the plane. And I had my phone and I was hitting refresh between the Emmy Twitter page and the Emmy web page, and I kept going back and forth," he revealed when asked where he was when the man playing his grown, adopted son Randall scored his win. "And then I finally saw it, and I just started laughing and crying, laughing and crying, laughing and crying...People are walking past me—and it was a late flight, the lights were dim—like, 'You OK?' I'm like, 'My son just won an Emmy. My son just won an Emmy!' I was like, This is just cool." As Ventimiglia sees it, there's no one more deserving than Brown. "That's the thing, I've been around his work through friends, through other shows that I've watched, for a very long time," he continued. "So, I've been a fan of his work. And then when I met him and got to spend some time with him over the course of the last year of having this job, just what a remarkable man, just a human being, you know? So, I think for me, it was always that victory of him of 'Oh, he's a talented actor, but he's also a human being.' So it couldn't have happened to a better guy." For more of Ventimiglia's absolutely adorable gushing over his co-stars, be sure to check out the videos above. This Is Us returns on Tuesday, Oct. 11 at its new time, 9 p.m., on NBC.